A UNT dining services food truck will launch on campus for a trial run Oct. 12. 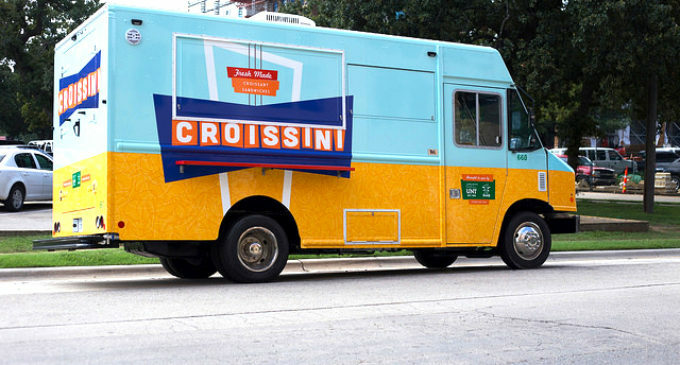 The food truck, Croissini, will offer the UNT community a variety of croissant sandwiches pressed like panini sandwiches. While this is not the first time UNT will have a food truck on campus, it will be the first one run by the university and not an outside vendor. Dining services made the final decision of having its own food truck in January, said Bill McNeace, executive director of dining services. The truck is set to operate on the main campus Mondays, Wednesdays and Fridays, and at Discovery Park on Tuesdays and Thursdays. McNeace said dining services is looking to operate the truck between 11:30 a.m. and 2:30 p.m., or the “lunch crunch” hours. A few trial runs will start Oct. 12 to let students and staff go through the process of ordering and making the food. They will conduct transactions, but there will not be any charges to students until “bugs are wired out,” McNeace said. Once it officially runs, UNT students will also be able to pay for the food using their flex dollars that are a part of meal plans. Half a croissini will cost $4 and a full croissini will cost $6. McNeace said dining services decided on these prices after doing a market analysis and looking at food options that are similar. Dining services settled on serving croissinis because they can be made and served very quickly, McNeace said. “Whatever the food is, you have to be able to get it out in under 60 seconds or it just doesn’t work,” McNeace said about the research on what food to serve. 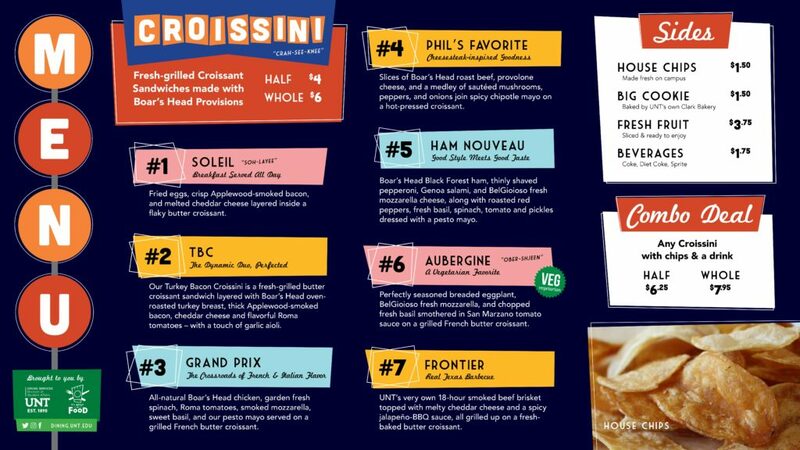 The croissinis can be easily served at any other place on campus, but having it in a food truck makes it “sort of like a novelty” thing, McNeace said. Besides the croissinis, the truck will also offer sides such as chips, a big cookie, fresh fruit and drinks; however the menu is still being finalized. “We wanted to provide a lot of options and combos in case students wanted to make a full meal out of it,” said Alyssa Torrance, the senior graphic designer for dining services. McNeace said dining services will set up the truck at a single location for a while before seeing where it can actually go since they cannot station it wherever they want on campus just because it is mobile. Dining services is working with the university to try setting the truck up on a part of campus that has a lot of student traffic but no convenient food from them, such as close to the Auditorium Building. Amy Yin, a music performance graduate student, said a food truck option is interesting, however she does not think she would visit Croissini. Other food options the university will soon bring include a stand-alone Starbucks in between the Hurley Administration Building and Willis Library, an Einstein Bros. Bagels inside the College of Visual Arts and Design and a free-standing, walk-up Chick-fil-A unit near Sage Hall, McNeace said. I was able to find goodd info from your content.